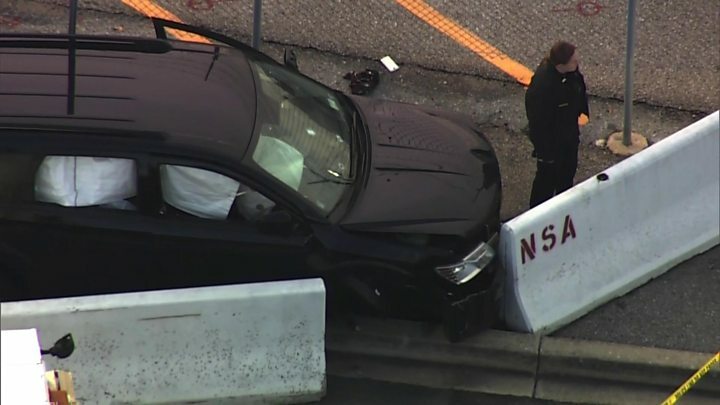 Three people were injured and three suspects were taken into custody after a car crashed outside the US National Security Agency's headquarters. Gunfire rang out after the black SUV approached the facility in Fort Meade, Maryland, without authorisation. There is no indication yet of any link to terrorism, FBI officials said. The driver of the car, a civilian and an NSA police officer were taken to hospital, the agency said. FBI special agent Gordon Johnson said the injured were all taken to hospital from the US Army base, which is about 30 miles (48km) north-east of Washington DC, after Wednesday morning's incident. No injuries appeared to be related to the gunfire, he said, and it appeared the gunfire was directed at the vehicle as part of NSA security protocol. "We believe there is no indication that anything more than an isolated incident of what happened here today this morning," said Mr Johnson, stressing that it was not terrorism related. The civilian and the police officer suffered non-life threatening injuries, but the condition of the driver, an unidentified male, is unknown. The other two people in the vehicle, both males, were taken into NSA custody. The vehicle appears to be a hire car, Mr Johnson said. He said that it was an ongoing investigation and "we're still in the fact-collecting business right now" when asked about the motive of the vehicle's occupants. CBS News images showed the black sports utility vehicle with what looked like bullet holes in the front windscreen and its air bags appeared deployed. It appeared to have collided into some NSA-stamped concrete barricade blocks outside the installation. NBC News said its helicopter could see police surrounding a handcuffed man sitting on the ground. The FBI said on Twitter after the incident: "NSA police and local law enforcement are addressing an incident that took place this morning at one of NSA's secure vehicle entry gates. "The situation is under control and there is no ongoing security of safety threat." Another statement from the NSA public affairs office said "a security incident" happened at one of its checkpoints known as Canine gate at around 07:00 local time (12:00 GMT). Maryland Congressman Dutch Ruppersberger tweeted that the reported injuries were not from gunshots. US President Donald Trump has been briefed on the incident. "Our thoughts and prayers are with everyone that has been affected," said a White House spokeswoman, Lindsay Walters. Fort George G. Meade - HWY32 is closed in both directions near Fort Meade due to a police investigation. Please take alternate routes, expect long delays and drive carefully. In March 2015, one person was killed and another seriously wounded after driving a vehicle up to the NSA's gate, ignoring commands to stop. News reports later suggested the two occupants of the vehicle may have been under the influence of drugs after attending a party. Despite highway signage, it is not unusual for motorists to take a wrong turn and end up at one of the heavily guarded gates to the sprawling NSA complex, where armed federal officers direct them to turn around.